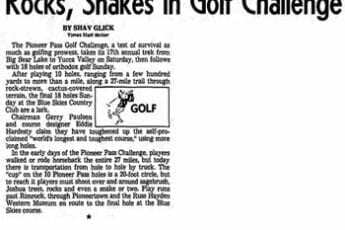 The Pioneer Pass Golf Challenge. 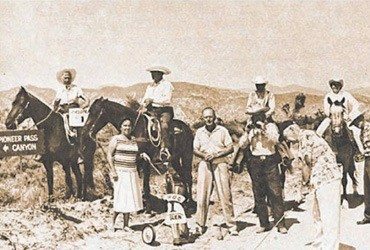 a test of survival as much as golfing prowess, takes its 17th annual trek from Big Bear Lake to Yucca Valley on Saturday, then follows with 18 holes of orthodox golf Sunday. After playing 10 holes, ranging from a few hundred yards to more than a mile, along a 27-mile trail through rock-strewn, cactus-covered terrain, the final 18 holes Sunday at the Blue Skies County Club are a lark. Chairman Gerry Paulsen and course designer Eddie Hardesty claim they have toughened up the self-proclaimed “world’s longest and toughest course,” using more long holes. 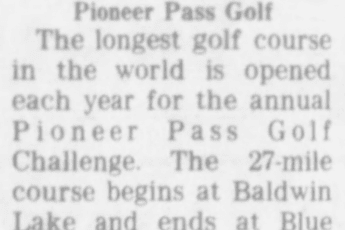 In the early days of the Pioneer Pass Challenge, players walked or rode horseback the entire 27 miles, but today there us transportation from hole to hole by truck. The “cup” on the 10 Pioneer Pass holes is a 20-foot circle, but to reach it players must shoot over and around sagebrush, Joshua trees, rocks and even a snake or two. Play runs past Rimrock, through Pioneertown and the Russ Hayden Western Museum en route to the final hole at the Blue Shies course.